Do you think pastry is undergoing a resurgence in both restaurants and in home kitchens? Or-have we always had an insatiable appetite for sweets? Should Pastry Chefs and home cooks stick to the classics? Or, should we be looking to discover new flavors and textures by changing classic desserts to fit today’s tastes? Thanks for that recap - I've used The Olives Dessert Table (and the recipes from The Olives Table and from The Figs Table) for years - with much success as a home baker. I may not always make all the components, but the ideas are good and make dessert much more memorable. I think we continue to have an insatiable appetite for sweets - and it may be getting worse as we continue to train our minds to want these by indulging. That said, I'm in the camp of knowing what is on the dessert menu before deciding what to order for dinner! Plenty of room for the classics and new desserts at home and in restaurants. As long as they taste good and appeal to my other senses. Last question - classics - both ways! I agree with you-we should celebrate the classics, but open our minds and palates to creating "new" traditions. And I like your adventurous side-cayenne in chocolate and popcorn flavors and textures in ice cream. Chef Sarah Kosikowski would agree with your thinking. I forgot to mention she put a hint of sweet paprika in the chocolate ganache to smooth out the flavor. It was delicious! 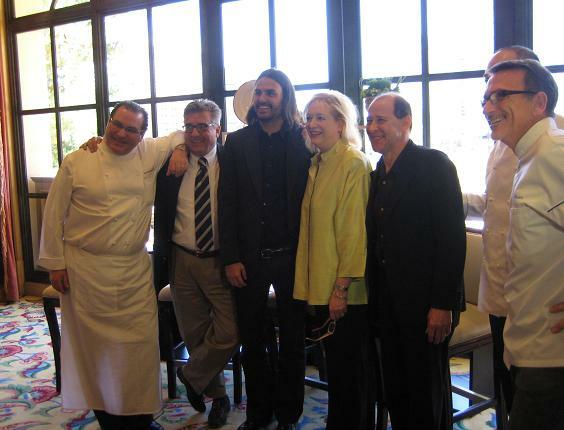 On Saturday morning, I attended a discussion the “Culinary Conversations: Farm to Table,” panel. -How do Chef’s in Las Vegas support local farms and producers and insure fresh, seasonal products for their restaurants? -Can the concept of a local, seasonal menu work in Las Vegas where everything is brought in from somewhere else? -Does it matter that there are not a lot of farms in the Las Vegas area? Chef Wong served two dishes that spoke of the “Farm to Table” theme. 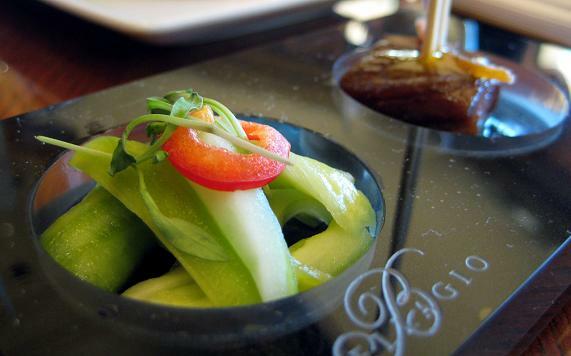 The cuisine in Las Vegas is often criticized for the fact that nearly all of the products are brought in from somewhere else. A criticism that I’ve felt has always been overly harsh and unfair. If we take the issue to the extreme, are we saying that we would never serve a slice of lemon with fresh Dungeness Crab in Seattle simply because lemons don’t grow in Seattle? For those of us who live in Eastern Washington, should we deny serving our families asparagus from California for Easter dinner because the asparagus from Walla Walla won’t be cut until late May? -The focus should be buying the highest quality products available. -The products should be “seasonal” and harvest at their peak flavor. 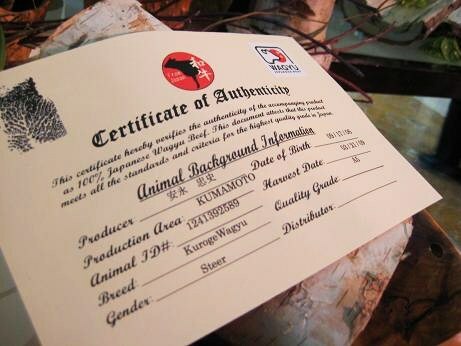 -The products should be grown and harvested in an environmentally-responsible manner. -Chefs can encourage consumer buying through promoting quality, fresh products that are reasonably priced in the market. Chef Moonen is one of the top Chefs in America-yet his contributions to the way we dine and eat doesn’t end when he leaves the kitchen. We think of Las Vegas as a barren desert when it comes to the agricultural landscape-but that is changing-and responsible Chefs like Rick Moonen are leading the movement. Chef Moonen is working with a farm that is 40 minutes North of Las Vegas. They have planted over 60 fruit trees, and raise chickens and hogs. The animals are served clean vegetables left-over from Chef Moonen’s restaurant. And—the next goal is to fuel the vehicles that drive from the restaurant to the farm with used cooking oils from the kitchen. Chef Bartolotta has very specific specifications for the seafood he buys for the restaurant. He buys wild seafood caught from single lines off dayboats. 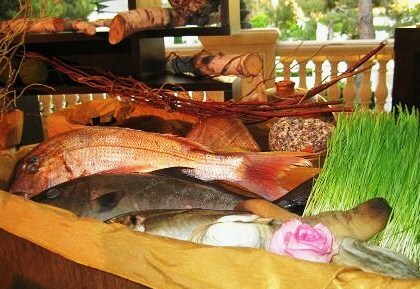 He has access, often via cell phone and computer, to track the seafood from the point of harvest, throughout the shipping process and final delivery to his kitchen at Wynn. There are two additional ingredients that form the basis of Chef Bartolotta’s cuisine-tomatoes and olive oil. The emphasis on procuring the finest, freshest seafood is continued in the selection of the tomatoes used in the restaurant. Chef Bartolotta has a group of farms across the country that he buys from-and he has a system to monitor each farm so that he knows precisely the time of year, down to the day, that a specific variety of tomato is ready for harvest. Earlier during my report on the dinner at Payard, we got into a discussion on the fact that “Chilean Sea Bass” was served-a species that has been horribly over-fished. Chilean Sea Bass are often caught in “trawl” nets-vast nets pulled by factory ships that scour the ocean and capture other species of fish and sea birds. I asked the panel what they thought of a Chef who listed “Chilean Sea Bass” on a menu-a menu in a high-profile, fine dining restaurant no less. Chef Bartolotta put it in practical terms-aside from the issue of a Chef’s responsibility, “there are so many other fish and shellfish with far more flavorful than Chilean Sea Bass.” I agree Chef. We must do our part to select fresh, flavorful foods that are harvested in a manner that is sustainable. None of the Chefs on the “Farm to Table” panel support fish that are harvested in large trawl nets-nets that basically drown the fish when they are captured, starving them of oxygen and ultimately affecting the flavor of the fish. Chef Wong operates on a scale so huge that it is almost inconceivable-he is responsible for the selection and procurement of all the foods served in one of the largest hotels in the world-venues that run the gamut from banquets, rooms service, casual dining, fine dining and pastry. The purchasing department, for food alone, is 20 people. 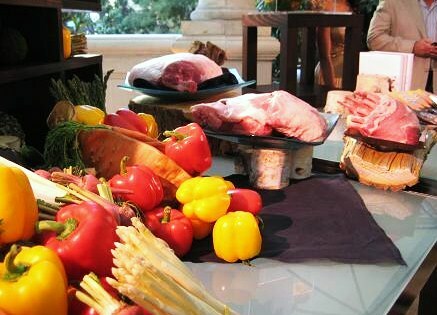 But the enormous scale of the Bellagio food and beverage operation doesn’t mean that quality and freshness are forgotten. The “Farm to Table” concept also applies. 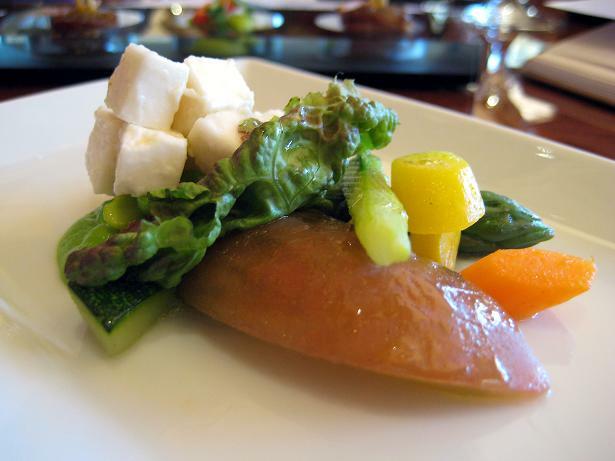 Chef Wong has a Chef whose job is to monitor quality-down to making sure that the fresh apples and Asian pears served on the buffet are tested for ripeness and sugar content in order to insure that they are at their peak flavor. Chef Bradley Ogden is a James Beard Award winning Chef and one of the first Chefs to actually work directly with foragers and farmers to supply his restaurants with fresh, organic, seasonal foods. For over thirty years he has been a leader of the “Farm to Table” movement. Chef Ogden has a forager for his Las Vegas restaurant who lives in Los Angeles. He talks to the farmers, he walks into the fields, he sees the animals grazing in the pasture. The forager is the link between the Chef and the farmer-and he is directly involved in planning the seasonal menus that Chef Ogden serves in Las Vegas. I applaud Bon Appetit for sponsoring such an important discussion-a discussion that we should carry forward long after the memories of the festivities of “Uncork’d” have faded. Las Vegas is a city often remembered more for glitz and glamour and the lost hopes of gamblers. Yet it's also a city that has the ability to affect the way we think about food, the choices we make. Bon Appetit serves as the vehicle that can bridge the gap between the Chefs and the public in order to further the way America eats. The issue of “Farm to Table” is not limited to a discussion of how Chefs source products for their restaurants. It’s also a discussion of how consumers can influence how vegetables are grown, how salmon habitat is restored and how we can serve better foods to our families. It’s about how we can eat in a more healthy and sustainable way. Chef’s Moonen, Ogden, Bartolotta and Wong can create the foundation and Bon Appetit can inform. It’s up to us to continue to bring the concept of “Farm to Table” home. David, thank you for another typically excellent post and topic, ever thoughtful. This panel brought to gether chefs who are not only some of the best and most respected chefs in Las Vegas, but in the entire country. That they and others cook in Las Vegas with passion, quality, and, yes, "soul" can , at least in my mind, no longer be questioned. Their dedication to quality produce is second to none and their approach may infact be the only reasonable way to bring to quality ingredients to Las Vegas as farming quality produce on a scale large enough to feed the restaurants of the city would likely have a negative environmental impact just on water use issues alone (though it may be a better use of water than all the aesthetic irrigation in the city). However, what this discussion has illustrated for me is that while Las Vegas may not lack soul or passion in its cooking, it does lack a distinct personality in its cooking that only a truly local or regional imprint can give. That is not necessarily the worst thing, but I now believe that is at the heart of what has been bugging me for so long and what has driven much of our discussion. In any case, Las Vegas is what it is and while it may lack a distinct culinary personality of place, it still offers much truly great food and cooking. Viva Las Vegas! When we set out on this "Klatsch," it was our mission to bring forward questions and issues that aren't typically asked or reported on at culinary events in Las Vegas. The focus tends to be on the entertainment aspect of the events. And while their is great pleasure that comes from the entertainment aspect of Las Vegas-I wanted to go deeper and stir a debate as to to how an event like "Uncork'd" can have a positive impact on the culinary issues of the day. I think we would both agree that after our debates last year about "Uncork'd"-and subsequent discussions on topics like the "James Beard Taste America" events in Las Vegas and the "Michelin Stars in Las Vegas" topic that there were still unresolved questions that lingered around dining in Las Vegas. I don't think we ever questioned the fact that there were top-level Chefs in Las Vegas that were cooking with superior ingredients. Yet we seemed to be left with a hollow sense that we had only touched upon--and had never fully answered or discussed--those lingering, deeper, questions about the state of cuisine in Las Vegas. I would agree with you that Las Vegas lacks in having a truly regional imprint to draw from in influencing the cuisine of the city. I suppose it's a combination of factors-the extreme climate and geographic location of the city and the fact that Las Vegas literally grew out of the desert in the past century without a long culinary tradition behind it are just two examples. Yet, as I think our "Klatsch" has uncovered, Las Vegas has some very unique culinary attributes to offer. I still have a few more reports to make--and I hope the discussions of the issues we've brought forward continue long after my reporting ends. The festivities were hosted by Barbara Fairchild, Editor-In-Chief of Bon Appetit and Mr. Alan Richman, who is, among his other associations and talents, a special correspondent for Bon Appetit. Presenting a “Grand Gala” dinner to an audience filled with professionals of the culinary world is a daunting task to say the least. The mere thought that Ducasse and Robuchon would be dining at the front table, (they were seated next to one another), and tasting your food is enough to make any Chef nervous. I’ve attended a number of these events, and every time I walk into the ballroom I have an expectation that I’m going to be served a memorable meal. When a customer dines at one of these Chefs restaurants, they should always expect an exceptional meal-but those expectations rise for an event intended to celebrate the culinary arts-an expectation that the food will be at the highest level possible. -What’s it like to watch some of the top Chef’s in America select products and craft a five-course dinner for hundreds? 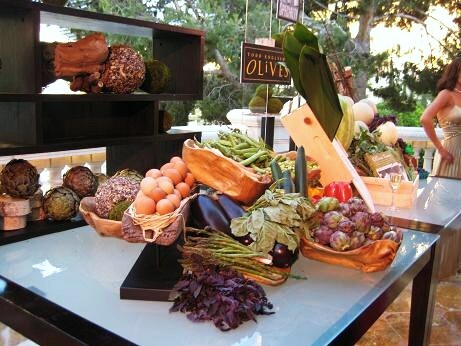 I assumed that the producer’s of the Grand Gala would be transforming a meeting room into a marketplace that mirrored a farmer’s market, perhaps with an Italian theme to echo the style and theme of the Bellagio hotel. And I imagined that we would actually “follow” the Chefs as they hand-picked the ingredients for each dish. Unfortunately, my assumptions of the format of the opening act of the Grand Gala fell short of what I found. We entered into the “Bellagio Marketplace” through a long corridor where we were greeted by a group of lovely Las Vegas showgirls and strolled onto a patio over-looking the pools and gardens. The architecture and settings of the Bellagio hotel are remarkable and ornate, and the patio setting for champagne and hors d’oeuvres was lovely on a warm evening in Las Vegas. Yet I quickly realized that there wasn’t really going to be an opportunity to stroll through a market with the Chefs. We were offered wine and hors d’oeuvres prepared by Todd English of Olives. I’m sorry to admit I didn’t indulge in the hors d’oeuvres as I wanted to save my appetite for the grand 5-course feast to come. As is sometimes the case when we dine at a restaurant-what we are promised on the menu is often not what is presented to us at the table. Such was the case regarding the introduction to the Grand Gala dinner. It can be as subtle as forgetting to garnish the gnocchi with the promised fried basil leaves, or as egregious as leaving the lemon buerre blanc off the Dover sole. It can be a lovely display of ingredients-yet not meet the expectation of the promised opportunity to walk with a Chef through a marketplace. It may be an oversight and unintentional-but failed expectations lower one’s experience to a level less than desirable level. Details-following through on what is promised and exceeding the guests’ expectations is just as important as presenting a beautifully fresh tian of perfectly prepared Spring vegetables. 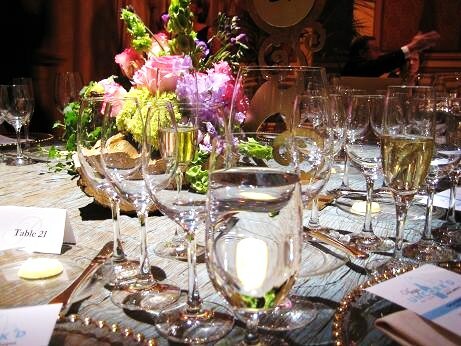 -Should, or can, a menu created by a group of Chef’s for a banquet, have a cohesive theme? Or, are gala banquet menus merely a showcase for each Chef’s to demonstrate examples of their cuisine? The second question I pose may or may not be appropriate in your opinion. I do think the individuality of each Chef at these events should be a showcase of their talent-and that talent should come shining through. Additionally, in the context of the Grand Gala dinner, I think that individual stars should stand to the side of the stage so to speak and that the menu should have cohesion through the flavors of the individual ingredients in each dish. The dishes should be served in a progression that links each to the next through those flavors. Chef Back recently became popular for his appearance on “Iron Chef America” where he cooked against Chef Bobby Flay in “battle Spinach.” (He lost). But his appearance on Food Network is but a small piece of Chef Back’s impressive resume and dedication to serving fresh fish. After a night of service in the kitchen at Yellowtail Sushi Restaurant, Chef Back arose at 4 a.m. on Saturday morning to drive with his assistant Chef to the Los Angeles airport, arriving at precisely the time an airplane landed from Japan carrying the Japanese Snapper that would be served in our first course. Chef Back explained to the guests that true Japanese Snapper is very expensive and difficult for him to procure. The fish is wild and caught on single lines off the coast of Japan. 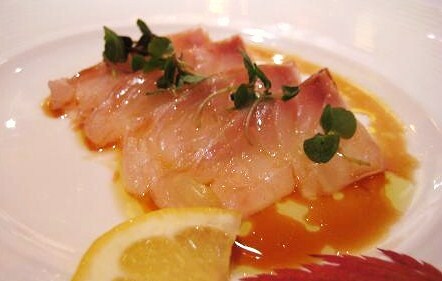 One merit of a great Chef is having the ability to recognize restraint-restraint in not over-powering the flavor of a delicate fish like Japanese Snapper, and then simply dressing it with a subtle “Tosazu” sauce-a blend of soy, rice vinegar and dried bonito flakes. The next course was without a doubt the star of this grand evening-a dish one would expect from Chef Julian Serrano of Picasso restaurant. 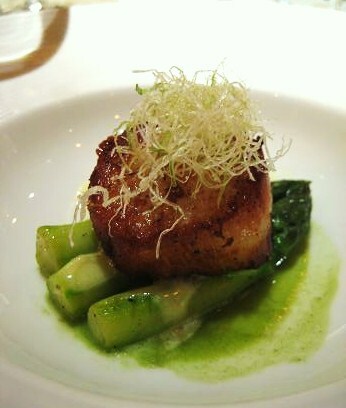 Another merit of an exceptional Chef is the talent to leave the guest in a state of wonder-wonder at how such pure, deep flavors can be drawn from what appears to be a simple ingredient like a scallop and a spear of asparagus. As we know, not all scallops are alike. Chef Serrano had selected the finest live, dayboat scallops and simply seared and roasted the beauties in butter. Typically we serve Spring asparagus with a heavy dose of traditional sauce “Hollandaise.” Chef Serrano’s delicate craftsmanship was displayed by elevating the Hollandaise into a light “Mousseline” by simply adding whipped cream to the traditional sauce and spooning a quenelle of the delicate mousseline to the side of the scallop. In a city that promotes having more “Master Sommelier’s” than New York, one would assume that the wines served at a culinary event in Las Vegas would be perfectly matched to the food. Now I’m far from an expert on pairing wines to food-I hold my own in general discussions at the table-“the white wines served with the seafood courses seemed a bit bitter and didn’t accent the sweet flavors of the fish,” is about as far as I can go to support my critique of the wines served with the first two dishes. I did speak to two friends who were at the dinner, both Food Writers and both serious students in the art of pairing wine with food. Both agreed that the wines served at the dinner, while quite good, fell short of the expectations for such a grand event-a bit of constructive criticism that will be shared with the hope of serving higher-quality wines at next year’s event. I would appreciate our wine experts sharing their thoughts on the pairings of the menu. Chef Michael Mina is a highly-recognized, award-winning Chef. He has four restaurants in Las Vegas, including Stripsteak at Mandalay Bay and Seablue and Nobhill Tavern at the MGM Grand. Chef Anthony Amoroso heads the kitchen of “Michael Mina” seafood restaurant in Bellagio. I have recently become a student of cooking pork belly. My personal tastes call for pork belly with a blistered, crackling skin, an underlying layer of juicy fat and a foundation layer of meat with a deep, pork flavor. Now I am not specifically criticizing this treatment of pork belly as I assume it was prepared and sliced in the manner in which the Chefs intended. But I prefer my pork belly cut into a thick steak if you will, so that each bite has the taste and texture of each element-crispy, (the skin), juicy, (the layer of fat), and meaty, (the layer of pork). 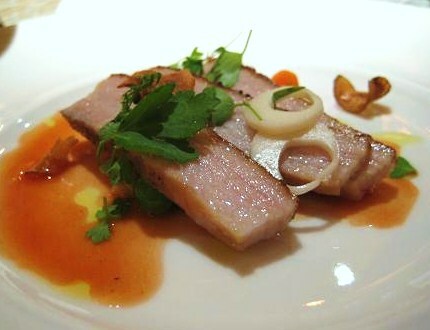 This rendition of pork belly was cut into thin strips which had the effect of basically cutting out any taste texture found in a thick layer of crackling skin. The pork suffered from a lack of natural flavor and was under-seasoned for my tastes. The subject of the beef served in Las Vegas, or across America for that matter, is a topic unto itself-and a topic that spirals into a discussion of grass-fed versus grain-fed, Wagyu versus Kobe, grade A1 or A5, dry-aged versus wet-aged, Angus versus Charolais. 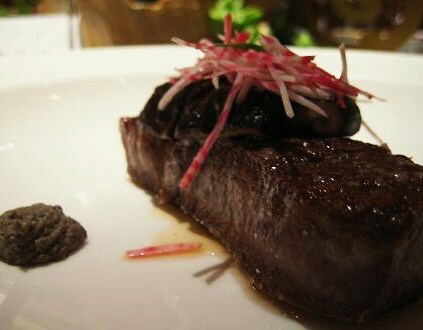 The restaurants of Bellagio serve a ratio of 70% beef to 30% seafood, an indication of the preference of customers to indulge in beef that is often priced much higher than live Maine Lobster. If you sense some cynicism in my voice as I enter into a description of the beef course served at the Grand Gala dinner then you are correct. But you should realize that my cynicism regarding “Wagyu” beef is born more out of my heritage as descendant of Oregon cattlemen rather than being a defendant of the intricacies of prime beef. I do find it hard to defend eating a 7 ounce steak that runs upwards of $159 dollars in a Las Vegas steakhouse-but such is the cost of what some perceive to be the best. Chef Robert Moore heads the staff at Jean-Georges Vongertichten’s Prime Steakhouse in Bellagio. 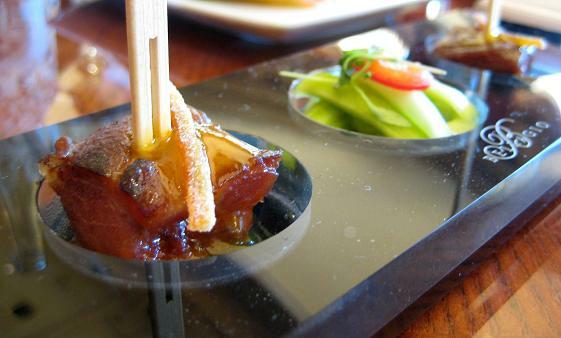 Chef Moore presented us his rendition of Wagyu with Asian flavors. My steak was cooked to a perfect medium-rare and it was delicious-just not something I would care to order in a steakhouse. Now maybe I haven’t eaten enough Wagyu or Kobe to appreciate the strands of marbled fat that ripple through the meat, and maybe that is why I tasted more fat than beef in this cut of Wagyu. 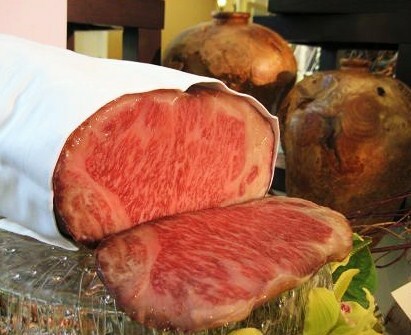 It must be my heritage, it’s that taste memory that will never be erased-the flavor and texture of old-fashioned beef cattle raised on the pastures of Oregon have jaded my tastes for “super-premium” Wagyu. After dinner ended, we were escorted back onto the patio for a dessert extravaganza presented by Chef Jean-Phillippe Maury-one of the world’s great French Pastry chefs. 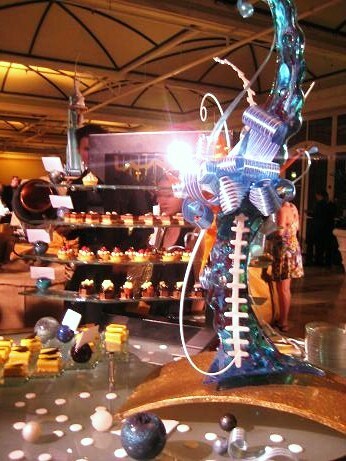 The displays of pastries and sweets was seemingly endless-everything from fresh-roasted hazelnuts and pecans, (actually being roasted at the display), artistic sugar sculptures, all manner of chocolate creations, candies, ice creams, sorbets, cakes, tarts and tortes. The sweets were accompanied by “Inniskilin Vidal Blanc, “Ice Wine,” Niagara Peninsula, Ontario, Canada, 2006.” I am quite a happy man when I end a wonderful evening with French pastries and Ice Wine. I suppose I can use at least one gambling metaphor since we are discussing Las Vegas. As fate would have it, just before dinner started, I was moved from “Table 9” at the last minute to what I thought would be the less desirable “Table 21” in the back of the ballroom. But then I remembered that “21” is supposed to be a lucky number in Las Vegas. I found myself the only gentleman in the company of two ladies from Las Vegas, two ladies from New York and two ladies from Calgary. Aside from a few details that probably only a cranky Food Writer would notice, the Grand Gala Dinner was a great success. What do you think? Can a meal at a banquet be as good as a meal at a restaurant? 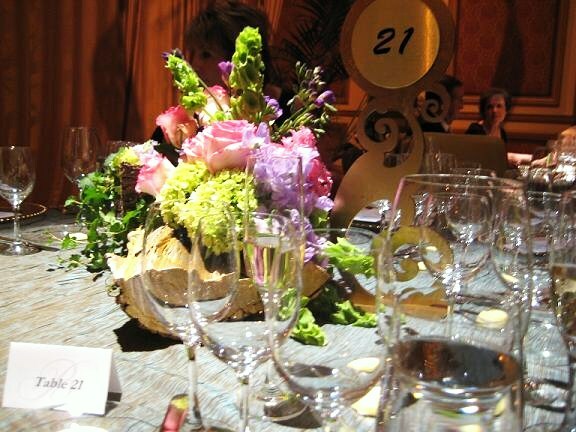 Our “Klatsh: Popping the Cork in Las Vegas” does not end with the Grand Gala Dinner. On Sunday I attended a very interesting private event. I was given the opportunity to re-visit the story of an Amerian icon and how her story and legacy--and the issues raised at "Uncork'd--can have a positive influence on the way we cook and the way we eat. On Sunday afternoon, I got a call that I had been invited to a private screening of the movie “Julie and Julia” at the theater complex at the Palms hotel. I was only loosely familiar with this upcoming movie about Julia Child. I had heard that Meryl Streep would be playing Julia-but other than that I had no idea what the story was based upon. Given the fact that I had been invited to a private viewing of a film that centered on a beloved American who changed the way we cook-and I was ending a week of culinary events in Las Vegas-it seemed only fitting to attend the screening of the movie. When you attend a private movie screening in conjunction with the “Uncork’d” events in Las Vegas, you are not served boxes of popcorn drowning in fake butter. As we entered the theatre we were given bags of black truffle popcorn and cotton candy courtesy of Chef Kerry Simon of Simon Kitchen and Bar at the Hard Rock Hotel. Chef Hubert Keller, proprietor of Fleur de Lys restaurant and The Burger Bar at Mandalay Bay Hotel, provided bags of scrumptious caramel corn. “Julie and Julia” is a film that is based on two stories, one from the past, one from the present. The first story is based upon the biography of Julia Child, “My Life in France,” (Alfred A. Knopf, 2006), written by Paul Child’s grand-nephew, Alex Prud’homme. It is a beautiful story that is centered Julia and Paul’s life in post-war France and her tireless efforts to write and publish “Mastering The Art of French Cooking,” (Alfred A. Knopf, 1961). The second story, and the story that links Julia’s past to the present, is based on the blog written in 2002 by Julie Powell, a government worker based in New York who attempted to cook every single recipe in “Mastering the Art of French Cooking” in exactly one year. The blog immediately became wildly popular and caught the eye of the national media. In 2005, the blog was turned into the book, “Julie and Julia, My Year of Cooking Dangerously,” (Little, Brown Company, 2005). It quickly became a best-seller and thus, the idea of producing a major motion picture about the story was created. Streep plays Julia Child to the hilt-the wild laugh, the unmistakable voice tone and inflection, the physical stature of Julia-a grandiose performance in terms of Streep’s ability to portray the unique character of Julia rather than a deep, dramatic performance. Stanley Tucci plays Julia’s dear, loving, supportive husband Paul, and Julie Powell is played by Amy Adams. “Julie and Julia” is what I would describe as a light, enjoyable movie about Julia’s early struggles to find her passion-a passion that is found in food and cooking and bringing the wonders of French cuisine to America. The film doesn’t dig very deep into Julia’s life in television-a life that came after her book was published and a life of cooking on TV that made one of the single-greatest impacts on how Americans cook today. As we walked out of the theater, each guest was given a complimentary copy of “Julie and Julia” and “Mastering the Art of French Cooking.” Julia Child’s masterpiece cookbook is still being reprinted 48 years after it was first published. “Julie and Julia” will open in theaters nationwide on August 7, 2009. No doubt the movie will inspire many more home cooks like “Julie Powell” to go out and buy a copy of Ms. Child’s ground-breaking cookbook. Does the public benefit, in a tangible, measureable way, by attending these events? Or, do they simply come away from four days of wining and dining at “Uncork’d,” satisfied that they had a memorable experience and the opportunity to meet a world class Chef? Is that experience, in and of itself, enough? (to further the Culinary Arts). Are these events relevant? Do they serve to further the culinary arts-or, do they merely serve as a public relations vehicle for the Chefs, restaurants, vendors and Food Writers who are involved with these events? 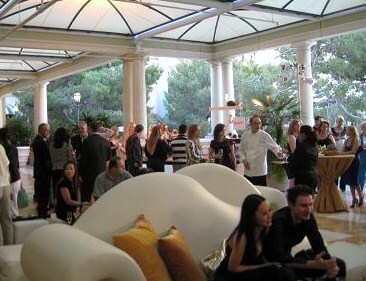 And finally, without culinary events like “Uncork’d,” would the culinary landscape be different today or in the future? David, excellent report which I enjoyed very much. Re the recent discussion on the EG ethics code may I ask if you were comped for any of these events or activities? Dave that is an excellent question. No, the Klatsch team did not sponsor or pay for any of the events I attended. I paid my own way for the airfare, hotel and all of the events I attended. (And by the way, many members of the "press" were given complimentary access to the events). I was given a complimentary ticket to the private screening of "Julie and Julia," and from what I know, it was an invitation only event and tickets were not sold in conjunction with Uncork'd. I have attended "Uncork'd" for three years now, and while it is expensive, it is personally worth the expense. This year I had the great opportunity to turn my report on "Uncork'd" into a Klatsch discussion and bring it to our Members. David - Thanks for the reply. Keep it up; as I said I enjoyed your report very much. I'll look forward to next year. David, I found your link before, but I can't seem to find it again! I keep looking for the tv set, but can't seem to find it. (whine) Am I nuts? I add my thank you for the report. As I listened to Chef Kosikowski explain her creative process, I realized that I had never really looked deeper into my personal definition of “trendy.” I had disregarded updating classic desserts as simply being “trendy”-a way to serve over-priced desserts to unsuspecting Las Vegas tourists. You and I travel in slightly different eG forums so I had no idea that you would have a conservative stance toward pastries. That word "trendy" seems a useless word to me unless we choose to never seek and experience evolution and betterment. While I don't seek the next "trendy" ingredient, I am constantly seeking ingredients and ingredient combinations that can take pastries to antother level for me. A very small example is Paul Raphael's Chocolate Chip Cookie recipe. Did he brown his butter and replace standard brown sugar with muscovado because it was trendy? I assume he did so to improve on the classic. Or when I did my celery dessert series last year it was not for the sake of trend but rather experimentation (with some hits and some misses). I know that my feelings of trendy technology sound similar to yours on pastry. I cringe when my spouse "has to have" the latest gizmo..."no you don't really have to have it," I respond. But one person's trendy is another person's improvement (hence my active use of FaceBook after months of refusal...same goes for the cell phone which I still despise). And so slowly and painfully I'm learning to remove that judgment from my paradigm because I only find it limiting. If I hadn't taken that step I never would have had as many wonderful meals and desserts as I have. And so for these reasons I recommend "trendy" be thrown out and you should go get your tonka bean espuma with radicchio gelato. To take Rob's dessert analysis re trendiness a little further, bad modern desserts are not necessarily bad because of they are modern, but because not everyone can pull them off or have good creative sensibilities. Is that any different than the fact that not every pastry chef makes classic desserts as well as others? Those who do pull off modern desserts make desserts that are really noteworthy not just for their novelty, but also because they are delicious. To me something truly creative and delicious is the epitome of fine dining whether it be in the savory or the sweet realms. I'm glad you've enjoyed our "Klatsch." In reference to a link portraying Julia's early appearances on WGBH-Boston, (PBS), sorry, but I didn't include a link in our discussion. But I'm sure that there are plenty of clips out there. Your analogy of trendy technology to my associations with "trendy" pastry are spot-on. In fact, up until a year ago, I didn't even own a cell phone-and I still don't know how to use it. As I mentioned in my review of the pastry class at Uncork'd, I finally started to realize that what I had previously considered "trendy" was, in fact, largely an issue of personal restrictions I placed on the creativity of a pastry chef. So I'm slowly moving forward in my thinking-and realizing that adding sweet paprika to a chocolate ganache can add a depth of flavor and texture that I previously would have disregarded. It will take me a bit of time to fully shed my negative attitudes for what I consider to be trendy in food-but I'll get there. Tonka Bean Espuma, sounds delicious and intriguing. Radicchio Gelato, give me some more time to think about that one. Don't think about it, David, just try it! It may or may not be good, but don't let your preconceptions get in the way. Thanks for posting all of these details on your trip to Las Vegas. There are a lot of questions out there, but I'll try to address some of them. Is this sort of event good for Las Vegas and the food scene there? Without question, I think the answer is yes. How much of it is boastful showing off? Based on what I see here and based on regular visits to Las Vegas, a lot of it is. But that's OK to me. To me, Las Vegas IS all about showing of excess. I personally don't think there is anything wrong with it. It's a place to go and do things and live live in a way you may not do on a regular basis at home. I enjoy the "over the top" aspects of the Strip and the hotels and try to go "all in" when I am in town. Right now, I think Las Vegas needs as much positive attention and stories as it can. This event sure seems to deliver. Does it really do more than that? I think it may. But I need to experience it for myself. As far as the issue of sourcing food. I am wondering how different this is in Vegas than it is in lots of other cities. Like, Dallas for example. Certainly, most regions have their own challenges. Las Vegas may have more than others, but even in a place like New York, restaurants still source many things from all over the world. Is it any worse to get seafood flow in from the Med in Las Vegas than it is to get fish from Japan in New York? Is there a long history of regional Las Vegas cuisine to build upon? Probably not. But is that bad? Texas and Dallas has it's own food history. But that certainly doesn't mean the restaurants are limited to doing food that matches that history. In some cases, I think NOT having that history can be liberating. There is nothing that might hold you back. No pre-conceived ideas as to what is right and wrong. Anyway, I really want to experience this event myself. Seriously considering it for 2010. The issue of sourcing food products is one of great debate of course, but I sense the debate is shifting somewhat-and that was a large part of the "Farm to Table" panel discussion at "Uncork'd." There will always be those advocates of a strict policy of only serving seasonal products that are locally grown and harvested within a short distance of the restaurant where those products will be served. Those restrictions can limit the creativity of the Chef and the quality of the diners experience. However, I sense there are more Chefs who are loosening their personal restrictions on this issue. If you can source wild salmon from the Copper River in Alaska and have it shipped to the desert of Las Vegas within 1 day of it being caught, then you should put it on the menu. The shipping distance involved and the harsh summer climate in Las Vegas presents its own set of unique challenges. But as Chef Savoy said at the Culinary Conversations panel discussion about French cuisine, "there is always FedEx." I think we are realizing that the concept of locally-sourced, seasonal products can apply to a Chef and a restaurant thousands of miles from where the products are grown. The ultimate test of course is found in the flavors of the dish. Can that Copper River Salmon taste as good in Las Vegas as it would in Alaska? Maybe not. Wild Salmon cooked over an open fire of alderwood on the banks of a scenic river is an experience unto itself. But the dining experience and setting of Las Vegas is also unique. High-quality products of the nature we are discussing, in the hands of a talented Chef, can create their own memorable taste experiences in Las Vegas. 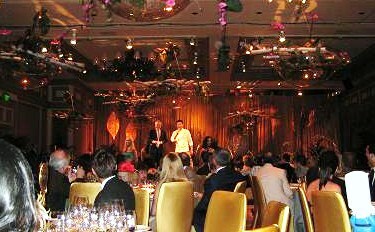 The "Farm to Table" discussion that was presented at the panel during "Vegas Uncork'd" didn't end when the events concluded back in May. John Curtas, the well-known Las Vegas Food Writer, Critic, Television and Raidio Host, (and a man associated with other food and non-food related activities in Las Vegas), was one of the first to break the news that Mario Batali has jumped into the "Farm to Table" discussion that we reported on during our Klatsch. Batali, apparently as adept at marketing as he is at cooking, is currently leading the charge to establish a farmer's market in Las Vegas, on the Strip in a hotel no less. Chef Batali is also charging ahead in leading the "green" movement at his Las Vegas restaurants. You can read about "Chef Mario Bets the Farm" at Mr. Curtas's website, eatinglv.com here. For the forseeable future, nearly all of the food products served in Las Vegas will continue to be shipped in from somewhere else. But one hopes that the "Farm to Table" discussion that began at "Vegas Uncork'd" and now continues with Chef Batali's efforts will be the stimulus for a new movement. eatinglv.com quotes Batali as predicting that Las Vegas could go to an all-sustainable cuisine in five years. While it's improbable that any sports book in town would give Batali odds on such an unlikely proposition, maybe someday, maybe in five years, a small orchard of Meyer lemons and a patch of Charentais melons will sprout in the desert and find their way onto a buffet table somewhere on Las Vegas Boulevard. There actually is a producing orchard run by the University of Nevada in North Vegas run by a great guy named Bob Morris. It is primarily for research, therefore not open to the public, staffed mostly by volunteers from the Master Gardener program. I worked up there last summer and quite a few restaurants in Las Vegas were purchasing the variety of products that are grown up there. In fact the first Slow Food dinner that was out here featured quite a few Nevada products (beef, green almonds, peaches, etc.) Being both a chef and a master gardener it was a really dreamy, albeit surreal, experience to work up there. Off the top of my head the orchard produces several varieties of peaches, apricots, plums, pluots, grapes, apples, figs, pomegranates, almonds, table grapes, wine grapes, melons, onions, asparagus, blackberries, tomatoes, garlic and of course nopal cactus. I know that a few restaurants, both local and in some of the resorts, even Whole Foods on W. Charleston, were getting product from the orchard last year. Things can indeed grow in the desert, it just takes a different toolbox, a lot of patience, and a bit more trial and error than the average garden for things to thrive. The irony is that with the dessert's limited water supply, it may actually make more sense to have food shipped in than home grown around Vegas depending on the source of water, probably the biggest environmental issue of the Southwest. One advantage of a local agriculture is to develop a local culinary identity with specific products that emphasize locality something not likely to happen in Vegas given the greater emphasis on variety and individual chef creativity. Of course one can argue, that the very existence of Las Vegas represents an environmental conundrum, especially with the way water is used so freely there, but that is another discussion altogether. Wow, a Master Gardener and a Chef-I'm envious. Thanks for relating your story. This is exactly the type of movement that we discussed at "Uncork'd" and one that needs to continue. It's going to be a matter of the Chefs of Las Vegas, the locals and the media of giving the movement the support it needs. We probably all agree that the sheer amount of food products served every day in Las Vegas is far greater than any local agricultural movement will ever be able to supply. But isn't that true of nearly any large city in America? In any case, the "Farm to Table" movement makes sense for so many reasons given the limitations of Las Vegas. John brings up an excellent point about the water issue. It's really the first thing that popped in my mind as being a big road block to lots of local agriculture in the Las Vegas area. I wonder if people would investigate and contemplate methods that use a lot less water than traditional crops. (Hydroponics??) I also wonder if any of the hotels would start growing some things at their own hotel. Places like Bellagio and Wynn/Encore that already may be running large operations to grow plants and flowers. You would think they could at least grow various herbs and what not for the restaurants on the property. Do places like Wynn/Encore really grow many of their flowers? I notice lots of orchids at Wynn, and cut orchids are usually cheaper to import than to grow in the United States. A couple of years ago it was from Thailand, but I haven't kept up on the current cheapest places. Not sure, really. I am just guessing. But I after seeing the conservatory at Bellagio, I would think they must have some sort of operation there to grow stuff.